At least 15 people died and 35 were injured when a fire swept through a crowded nightclub in the Ecuadorean capital, Quito, officials have said. It is believed that the blaze was caused by fireworks, meant to be part of a performance by a rock group. Some 300 people were reported to be attending the afternoon concert at the Factory nightclub when the fire began. Rescue workers say people were hampered in their attempts to escape by closed and locked exit doors. Raul Carrera, who worked at the club, managed to escape with others through the bathrooms. 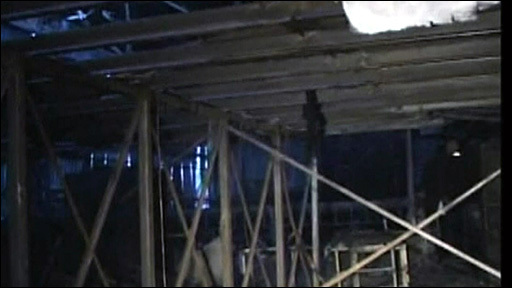 Mr Carrera told Associated Press that the fire took hold with great speed and that there was debris falling everywhere. "We couldn't save anyone because everything was steam and thick smoke. It was really hot," he was quoted by AP as saying. Quito fire chief Jaime Benalcazar told a local radio station that the fireworks caused the inferno and that the "exit doors were locked with a padlock". Firefighters reportedly used axes and sledge hammers to break down walls in effort to help people escape. "People were screaming for help. 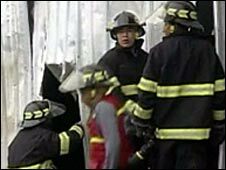 We tried to tear down the walls, but we couldn't," Giovanni Vargas, a 21-year-old who was close to the club when the fire began told Reuters news agency.